Susie McMonagle: dust off that Jeff award shelf. One would never associate “next to normal” with traditional summer musical fare. Light-hearted it ain’t. The Tony-award winning show is an uncompromising look at one family’s attempt to cope with the matriarch’s mental illness. The show also serves as an indictment of a mental health industry that at times seems more interested in grooming life-long pill-popping consumers than addressing the underlying causes of some disorders. Musicals such as “Gypsy” have dipped the proverbial toe in the mental health water (“Rose’s Turn” is essential a nervous breakdown set to song), but few shows have ever wrote an entire book around the topic of mental health. 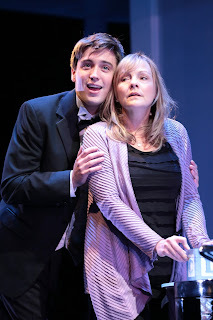 As a musical, “next to normal” is less “Mama Mia!” and more “Mother Courage.” This makes the current production of the show at Drury Lane Theatre in Oakbrook Terrace something of a major risk. I mean no disrespect here, but the show’s gritty, sung-through, rock score and serious subject matter would seem to initially be incongruent with the typical, older suburban Drury Lane subscriber. Whether it is the Pulitzer-prize winning script or the superbly acted, sung and directed show, the audience at the opening was incredibly receptive to the show. If this production was a gamble, it has paid off in spades. In the lead role of Diana, a wife and mother trying to navigate the fine line between medication and memories, Susie McMonagle is riveting. 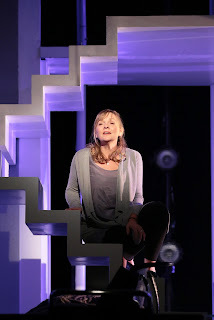 While the show was originally a vehicle for Alice Ripley, I actually preferred McMonagle’s vocal approach to the role. True, Ripley’s voice had more of a razor’s edge than McMonagle’s that on the onset seems to be more true to the rock score, but McMonagle’s “folk-singer” style makes her Diana more approachable. If the statistics regarding mental health and bipolar disorder are to believed (and I frankly believe they are), we all know someone just like McMonagle’s Diana. As her much put-upon yet still supportive husband Dan, Rod Thomas turns in what has to be the best performance of his career. Usually cast in comedic roles (you might have seen him in Second City’s “The People vs. Friar Laurence”), the funny man can not only emote, but also belt out the demanding score with the best of ‘em. As son Gabe, Josh Tolle brings the needed intensity required of the role. The pacing and acting could not be better in the scenes where Gabe and Dan both engage in a tug of war in regard to Diana’s course of mental treatment. Gabe wants to flush the drugs; Dan wants to keep experimenting until they get it right. Each has their own selfish reasons for advocating their respective courses with Diana stuck in the middle. 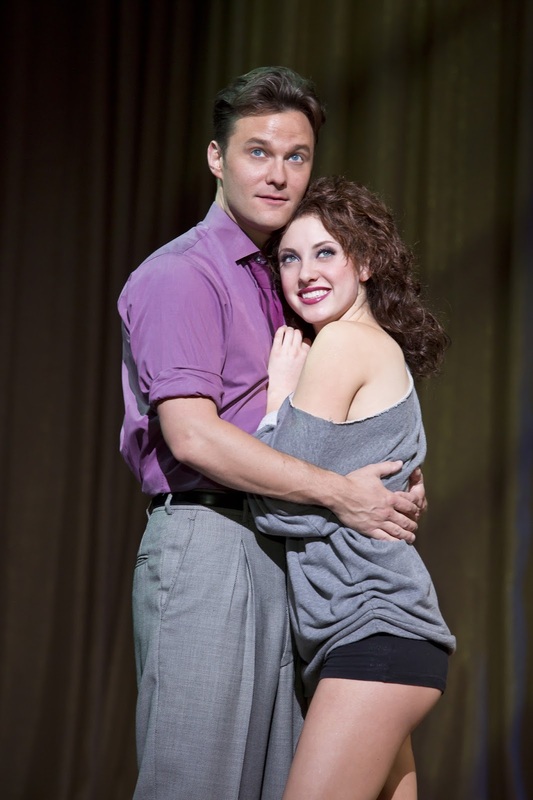 Newcomer Callie Johnson (as daughter Natalie) has some pitch problems early on (a fate suffered by the Ms. Ripley in the original Broadway run, too). Should those persists, you’re likely to overlook them thanks to her intense portrait of a teenage girl who can’t seem to live up to perceived expectations. Her character resonated more with me than in previous productions. A second act scene between mother and daughter, set in a hospital, is exceptionally moving. Rounding out the cast are Skyler Adams (hilarious as Natalie’s would-be boyfriend who just won’t quit pursuing her) and Colte Julian (in the dual role of Dr. Fine and Dr. Madden). Julian finds more meat the Madden than he does in Fine, but is nonetheless engaging. Scott Davis’ monochromatic scenic design (ok, there are black chairs so I guess it is bichromatic) perfectly captures the sterility of an average suburban home. Costume designer Sally Dolembo follows a similar pallet in the first act, slowly introducing pops of color in the second act as a way of visually capturing subtle changes to Diana’s mental state. Under William Osetek’s direction, the pacing and flow could not be better. Actors move from fantastical scenes within Diana’s head to those grounded in reality with aplomb. 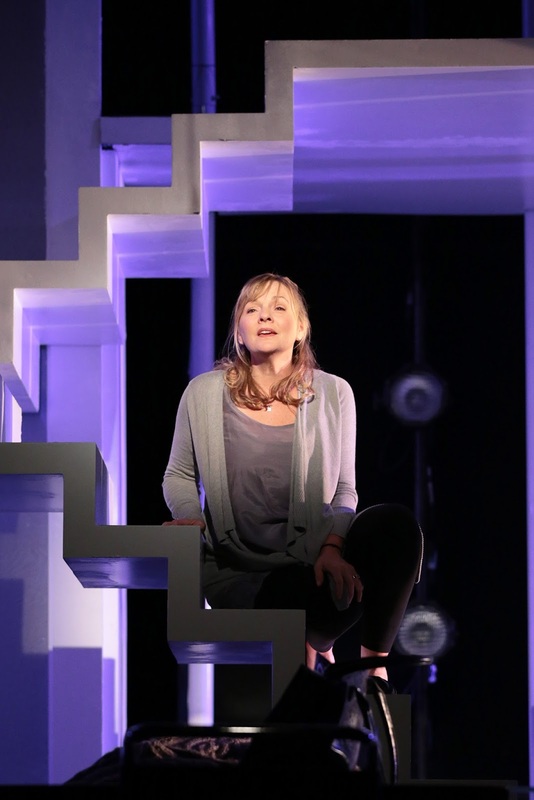 “next to normal” is musical perfection; it's a theatrical moment not to be missed. Jillian Mueller (as Alex Owens) in an iconic moment from "Flashdance: The Musical"
1983's "Flashdance" was what passed for a movie musical in the 1980's. It was a series of quick-cut, frantic music videos stretched around a simple (and implausible) plot involving an 18 year-old steel welder by day and stripper by night who dreams of attending a prestigious dance academy far beyond both gritty factories and stripper poles. Though critically lambasted (the late Sun-Times film critic Roger Ebert has it on his "most hated" films list), it went on to earn more than $148 million world-wide and spawned a slew of top 10 hits including "Flashdance...What a Feeling," "Maniac" and "Gloria." And now, much like 1980s movie musicals such as "Footloose" and "Urban Cowboy," the 30 year-old film "Flashdance" is being prepped for new life as a Broadway musical. Where's a good arc welder when you need one? The bones of a decent musical are present, but some cutting and soldering are needed if the show hopes to fair better on the Great White Way than those two other shows. Let's say you are able to suspend disbelief over the original film's plot. At its core, "Flashdance" isn't a bad idea for a stage musical. A plucky, working class gal Alex Owens (an endearing yet still ‘edgy” Jillian Mueller) dreams of reaching for that brass ring, overcoming the systems of class, education, economics and gender. Her love interest is Nick Hurley (Matthew Hydzik , a charming, boy-next-door type), the grandson of the owner of the factory where Alex works. The pair share decent chemistry, initially clashing before falling in love. The two romantic scenes in the show come off awkward,though. Mueller is a relatively petite actress and is nearly on pointe any time she has to kiss her much taller leading man. “Gloria” notwithstanding, the score soars when recreating the hit songs from the film soundtrack, but the 16 songs representing the new music and lyrics by Robbie Roth (with additional lyrics by Robert Cary), while succeeding in capturing the saccharine nothingness of many a ‘80s pop ballad, are nonetheless instantly forgettable thanks to some truly clunky and forced rhyming. Director/choreographer Sergio Trujillo ("The Jersey Boys" and "Memphis") manages to both pay homage to the film’s original choreography and put his own signature onto things. The ensemble dance numbers in particular are energetic and mesmerizing. The film’s iconic water scene even feels fresh and new. "Flashdance: The Musical" through Aug 18 at the Cadillac Palace Theatre, 151 W. Randolph. Tickets, $18-$85. Call (800) 775-2000.